Extraordinary scenes ensued on Monday as a unionist/loyalist “protest” quickly descended into a mob assault on the City Hall building itself. A mob breaches the council chamber itself as the PSNI failed to intervene. Later in the week, as unionist/loyalist “protests” spread, the homes and offices of the cross-community Alliance Party were targeted in an unprecented manner. The party hold the balance of power on Belfast City Council between those councillors who identify as nationalists and unionists, and its long-awaited decision to end the year-round flying of the British Union Jack over Belfast City Hall, over a decade in the making, has deep symbolism for both communities. This week’s clashes were among the most serious political violence by unionists or loyalists in several years, and have even been compared to the intense Drumcree-related disturbances of the late 90s. 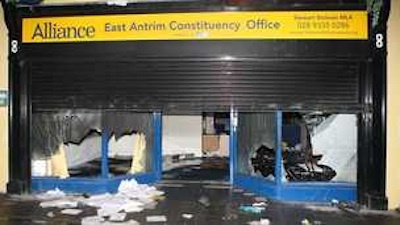 The most serious trouble took place in Carrickfergus, County Antrim, as a mob torched the Alliance Party constituency office. Former Carrickfergus councillor Stewart Dickson compared the targeting of his constituency base to “Nazi Germany in the 1930s when one political party dares to be different is attacked”. Just hours later, two Alliance Party councillors and their 17 month-old child were forced to crouch together in their bedroom for safety after a window was smashed at their home by paint bombs in Bangor, County Down. In another incident in the town, there was an attempted arson at the constituency office of Alliance assembly minister Stephen Farry. Schools in north Belfast allowed pupils to leave early as a loyalist mob gathered outside Alliance Party offices in Glengormley in north Belfast. Other schools and businesses were forced to close early. Although disturbances being openly organised on social networking sites, the PSNI failed to prevent the violence or effect any subsequent arrests. In east Belfast on Tuesday, members of the PSNI were even observed to stand back as loyalists set upon the offices of local Alliance MP Naomi Long, draping it in Union Jack flags and shouting that her seat would soon be retaken by DUP leader Peter Robinson. An Alliance councillor in the same area was also forced to flee her home after receiving death threats. Party leader David Ford said the attacks were an “assault on democracy”. He blamed the main unionist parties, the DUP and the UUP, for inflaming the situation by distributing 40,000 “bogus leaflets” condemning the Alliance position ahead of the controversial City Hall flag vote. Sinn Fein Deputy First Minister Martin McGuinness said there was no justification for attacks on homes and offices. He said the violence was an attack on the “democratic decision” taken by Belfast City Council on Monday. “Political unionism needs to accept that. They need to call for an end to these protests and for those involved to step back,” he said. SDLP leader Alasdair McDonnell said those who carried out the attack could not “hide behind love for a flag and then seek to wreck the rule of law in defence of it. “This is a disgusting attack against each and every person in this society who supports the rule of law and supports the political process,” he said. There was also renewed intimdation of the general nationalist community, with Union Jacks hoisted along several main routes across the Six Counties, and roads closed due to sporadic disturbances. Flags were also attached to lamp-posts along parts of the Ormeau Road in south Belfast, as well as some areas of north and east Belfast. Union Jacks were placed on lampposts in Glengormley, Ballymena, Ballymoney and Magherafelt. On Thursday night, a crowd of loyalists provocatively erected a Union Jack outside St Matthew’s Catholic Church in east Belfast on Thursday night. Again, the PSNI were seen to stand by and observe the incident. It came three days after loyalists throwing missiles targetedf the church and Catholic homes in the Short Strand area. Local Sinn Fein councillor Niall O Donnghaile said it was a “typical thing” that if loyalists or unionists don’t “get their way”, they “attack the Short Strand”. In Ballymena, County Antrim, Sinn Fein councillors had to be escorted from a council meeting after a violent loyalist mob gathered outside on Thursday night. The PSNI again made no effort to dispel the mob. The intimidation was described by councillor Monica Digney as “an absolute shame and a disgrace”. On Monday, the PSNI was strongly criticised for failing to secure Belfast City Hall from loyalist attackers as council voted, as expected, to end the year-round flag display. At one point the small police presence was withdrawn entirely, allowing the 1,000 strong mob to ransack the grounds of the building, damaging cars before breaching the council chamber itself. A photographer with the Associated Press was badly beaten by the police during the disorder, while two council security guards wre injured by unionists. The PSNI’s failure to oppose Monday night’s mob attack on the City Hall was strongly criticised by nationalists, as were the force’s subsequent excuses. In an extraordinary sequence of events, known paramilitaries and hooded loyalists youths gathered at the building in the hours before the vote. Even as the ‘protestors’ began burning Irish tricolour flags, the PSNI maintained a hands-off approach until the vote result was announced. At that point, the mob quickly broke a rear-entry lock and massed at the doors into the council chamber, terrifying nationalist and unionist councillors alike. Riot police were eventually deployed only after the councillors complained that they were in fear of their lives. PSNI Chief Superintendent Alan McCrum denied the force’s inaction had facilitated violence on several occasions this week. “There’s a balance to be struck between on the one hand facilitating lawful peaceful protests and on the other upholding the law,” he said. “At City Hall I think the approach we took was entirely correct, we wanted to facilitate people, we didn’t want to exacerbate the tension,” he said. Sinn Fein Policing Board member Gerry Kelly said it was “a disgraceful police operation - or lack of a police operation”. “If that had been 1,000 or more republicans, it would have been very different. There they would not have left it that they were able to come into the back of city hall.